Build a Morris chair with newspaper rack and smokers tray that's an inviting blend of classic and modern, and a comfortable addition to any outdoor space. 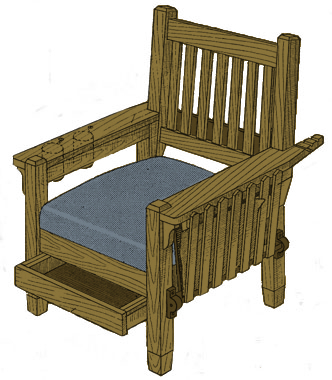 Click here for detailed morris chair with drawer plans. A comfortable and novel after-dinner chair for the man in the household can be made by fitting a Morris chair, or other armchair, with devices which appeal especially to a man. The chair shown is that of the ordinary mission Morris type. It is of simple outline and can be made by the home mechanic of fair skill in furniture making. The details of its construction, while not essential to a description of the special fittings, are shown in the several working drawings. The joints used for the framework are of the common mortise-and-tenon variety. The back is a plain frame, fitted with vertical slats, and hinged to a shoulder in the back legs, as shown in the side view. 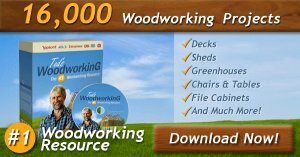 For a substantial piece of furniture, oak or other hard wood should be used; as a piece of porch or summer-cottage furniture, the chair may be made of softer woods. The cushion can be made of various leathers, or upholstery fabrics. It is built over a wooden frame and is removable. The seat bottom may be paneled, and a loose cushion fitted into it, and a similar one bound with thongs to the back of the chair. The drawer is slightly different from the standard construction in that the front is arranged as a blind rail. It fits snugly between the front legs and is suspended from strips fitted between the pairs of legs at the sides. No handle is provided, as the drawer can be opened easily by grasping it underneath the front board. Pipes or a variety of other articles may be stored handily in it. The newspaper rack, as detailed, is made up of strips forming a basket, which is supported by a rod pivoted in wooden hangers, one on each of the side legs, adjoining the rack. When papers are not being taken out or placed in it, the rack is tilted back against the side of the chair arm. The ash and tobacco trays, which may be made large enough for cigars, are suspended under the right chair arm by means of rings made of strips of brass. These holders are pivoted on bolts, and the trays can be removed easily for cleaning. They are ordinarily swung out of the way, under the arm. The special features of the chair may also be adapted to the needs of nonsmokers.